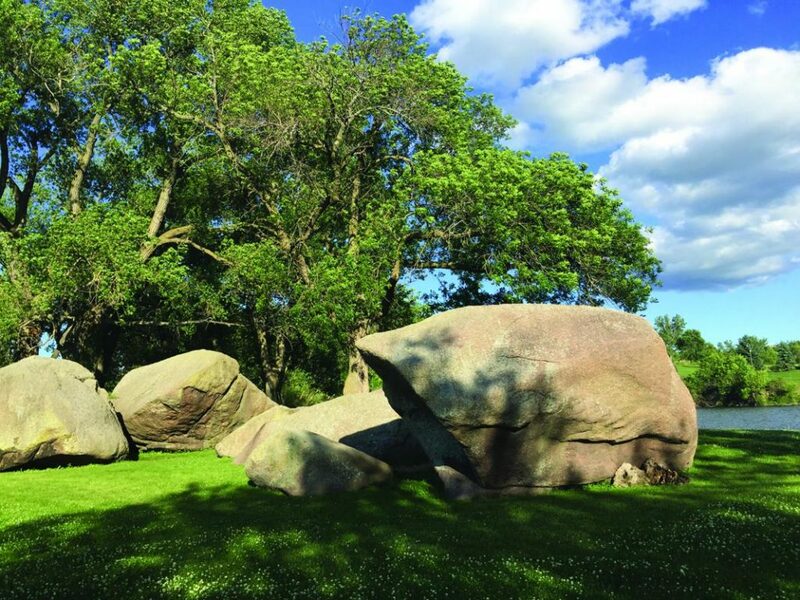 Pipestone National Monument, a sacred spot to this day, showcases an intriguing aspect of Native American culture. 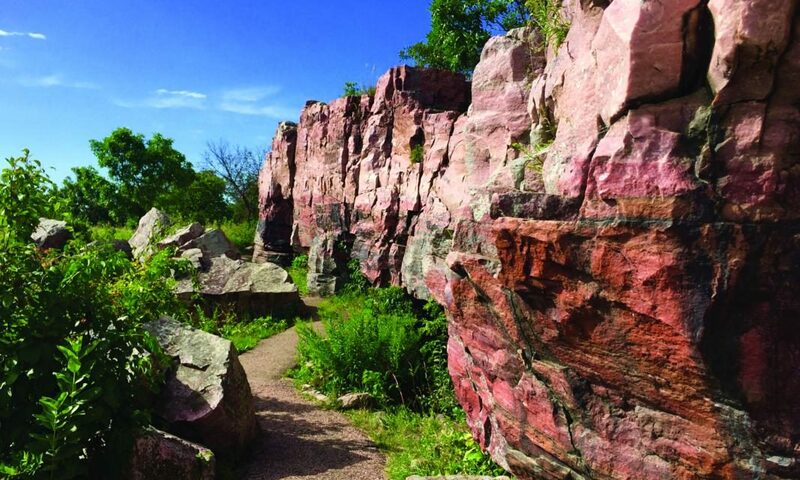 The pinkish, soft but durable pipestone clay found at this quarry site in southwest Minnesota has been carved into pipes by countless generations of American Indians. The pipes are used for prayer with the belief that its smoke carried the prayer to the Great Spirit. 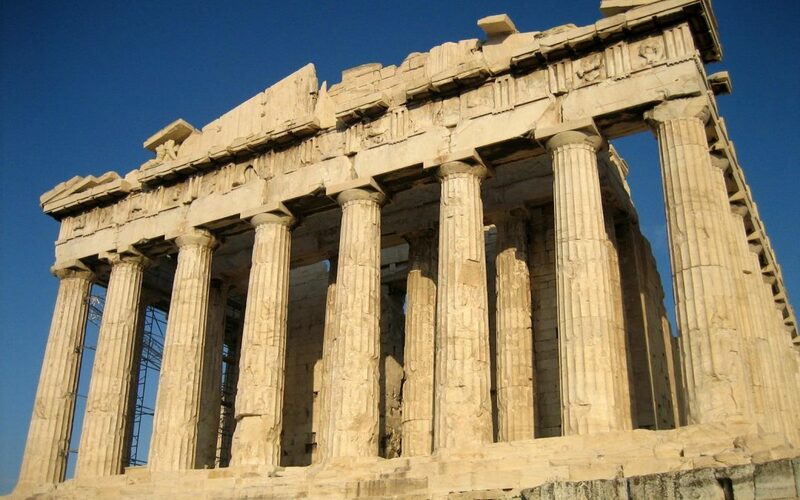 Many tribes journeyed to this sacred spot, and even enemies laid down their arms and entered the quarries peacefully. 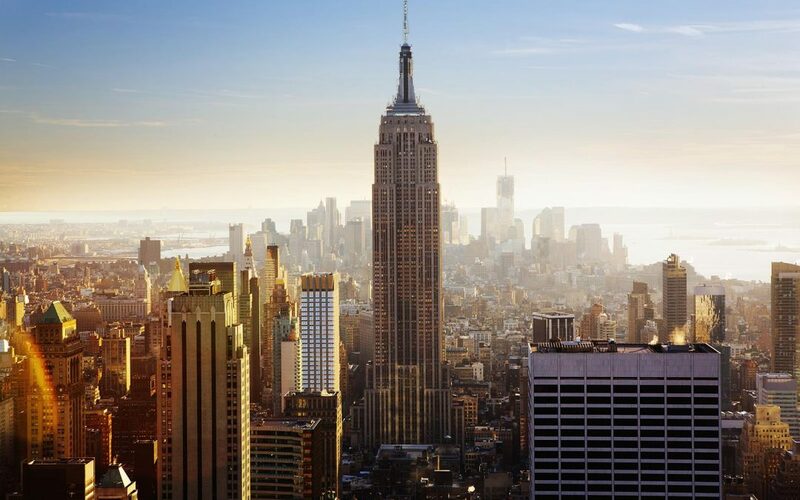 The use of pipes derived from these grounds went well beyond Plains tribes. “Many visitors do not realize that pipes were such a big trade item among Native Americans,” states Bud Johnston, president of the Keepers of the Sacred Tradition of Pipemakers. Examples of handiwork from Pipestone have been found in Mexico and on the Pacific Coast of the U.S and Canada. Upon entering Pipestone National Monument, take notice of the Three Maidens. It was at this traditional entrance to the quarries that those coming in would leave an offering of tobacco for the guardian spirits. Of the 79 petroglyphs placed around the Three Maidens, 17 of the historic carvings are now on display at the visitor center. 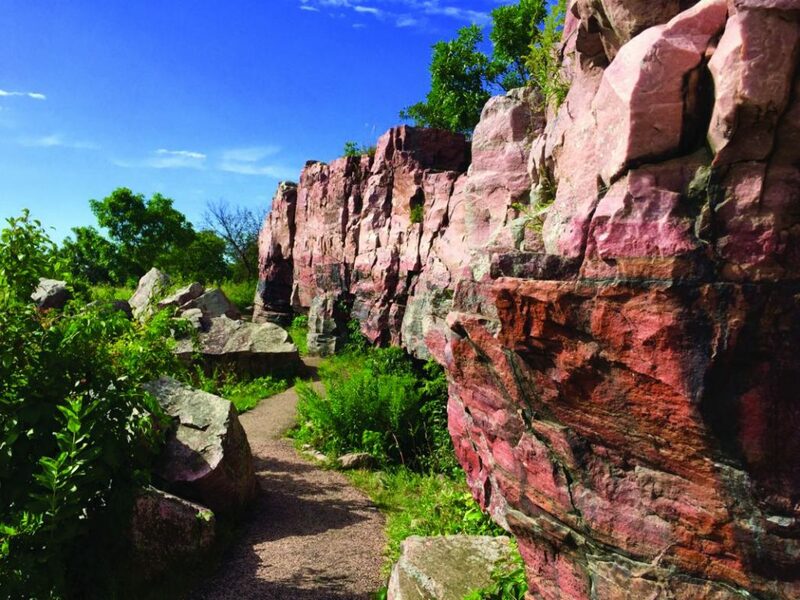 Visiting Pipestone National Monument is a truly inspiring experience. The best way to begin is by watching the visitor center’s 22-minute film Pipestone: An Unbroken Legacy. There’s also a museum featuring exhibits about Pipestone’s unique clay, American Indian culture and its 3,000-year history. Pipes from the early 1900s and the remaining petroglyphs are featured items. Groups should take advantage of the nature walk along the Circle Trail and allow at least 45 minutes for the full experience. Points of interest along the trail include Winnewissa Falls, the Oracle, Old Stone Face and the native tallgrass prairie. The walk is wheelchair-accessible with assistance, and a guide can be made available with advance notice. The nearby town of Pipestone has antique and gift shops, the Pipestone County Museum and Historic Calumet Inn, which is listed on the National Register of Historic Places. The Gift Shop & Gallery of the Keepers of the Sacred Tradition of Pipemakers, located in the Historic Rock Island Depot, hosts workshops on subjects from storytelling to dance and drum making. 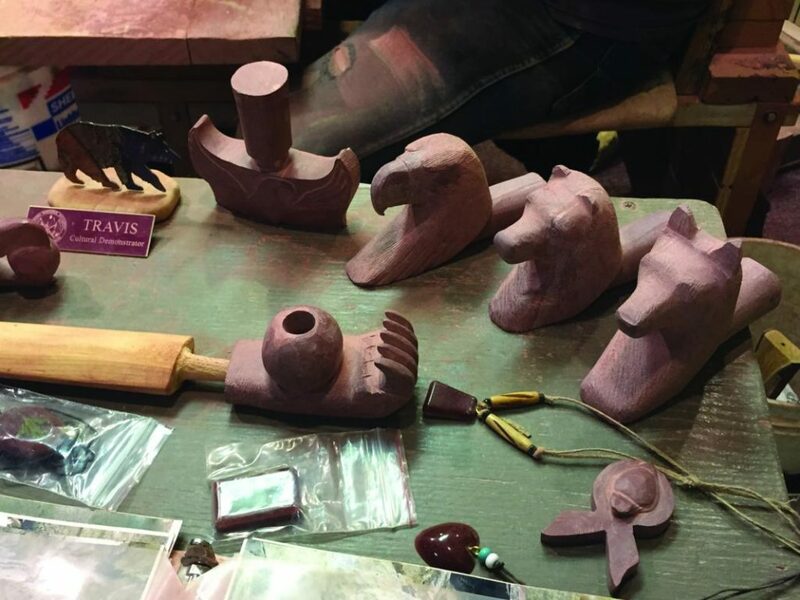 A 60-minute session lets each participant make his or her own pipestone pendant. A two-day pipemaking workshop is also available. 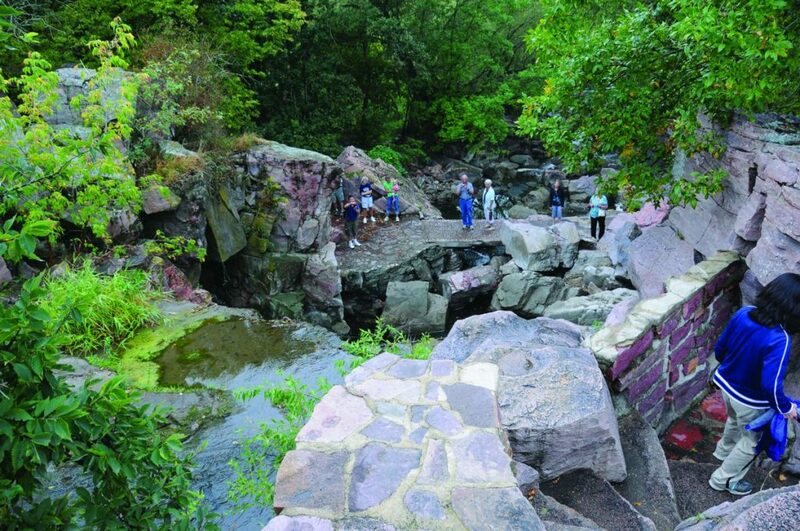 Begin planning your visit to Pipestone National Monument at nps.gov/pipe, or call 507-825-5464, ext. 214. For information on lodging, dining and area attractions, contact the Pipestone Chamber of Commerce & Visitors Bureau; pipestoneminnesota.com/visitors, 507-825-3316. To schedule a visit or workshop at Keepers of the Sacred Tradition of Pipemakers, visit pipekeepers.org or call Bud Johnston directly at 605-595-5229.